One of the most important debuts at this year's Edinburgh International Festival is a new production by the Palestinian National Theatre. The company hopes the show, Jidariyya, will help them to show the world there is more to Palestinian culture than conflict. But their visit has been overshadowed by the death of the poet whose work inspired the play. 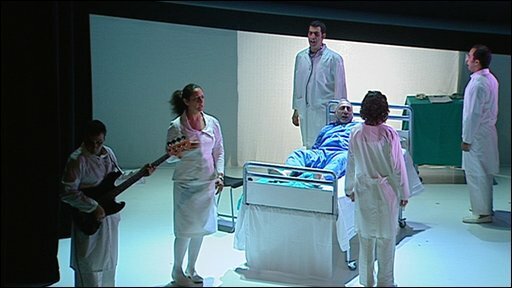 Based on a play by Mahmoud Darwish, Jidariyya is set on a hospital ward, where the poet himself hovers between life and death and considers all the things he might have done. It is made even more poignant by the death of Mr Darwish, 67, one of the most important voices in Arab culture. His funeral was held in the West Bank city of Ramallah on Wednesday, just a day before the show opened in Edinburgh. 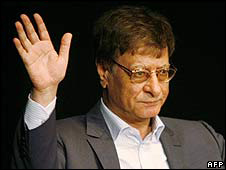 Amir Nizar Zuabi, director of Jidariyya, said the death of Mahmoud Darwish was a "great loss". He said: "It means that the responsibility of doing the show has grown massively. "He is much more than a poet to us, the whole cast feel they know him very personally through his poetry. "It seems strange that at the same time as his funeral is taking place we will be on stage. Mr Zuabi added: "In Jidariyya he wrote the words 'The only thing that defies death is art'. "He has left behind a huge heritage which for us is the best way to commemorate his memory and respect him." Khalifa Natour, who adapted the poet's work for the stage and performs in the show, said: "We felt we would honour him with the show but in fact he honoured us and I think always will. "He gave us a gift, we felt he was with us there on stage, in his words and his soul. And that made the performance very emotional." Actor Reem Talhami said: "Being an artist is not an easy life anyway, but being a Palestinian artist is even harder and more complicated. "In Palestine, you can't plan your day, you can't plan anything and in this sort of situation, you will never be able to." Palestinian National Theatre is a fairly new organisation, set up just 24 years ago with the aim of proving there is more to Palestine than unrest and anger. Jonathan Mills, director of the Edinburgh International Festival, said most people would probably be surprised that there was a Palestinian National Theatre. He added: "The more clichéd impression would be 'that's a bunch of angry young men in Ramallah, making public their frustrations'. "Nothing could be further from the truth. This a group of people who are incredibly lyrical, incredibly poetic and rather gentle." For most of us our knowledge of Palestine is restricted to what we learn in news reports and that is why this production is so important to the company. It is a chance to boost their profile on a world stage but also a chance to tell audiences there is so much more to their culture.